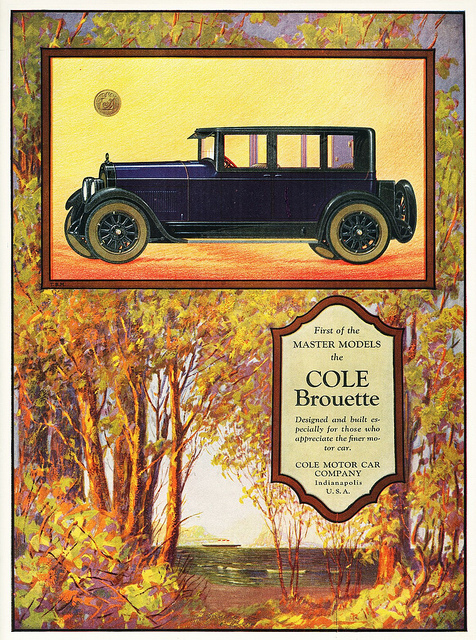 “There’s a Touch of Tomorrow in all that Cole Does Today”– Marketing slogan which showed the spirit behind the Cole Motor Car Company. 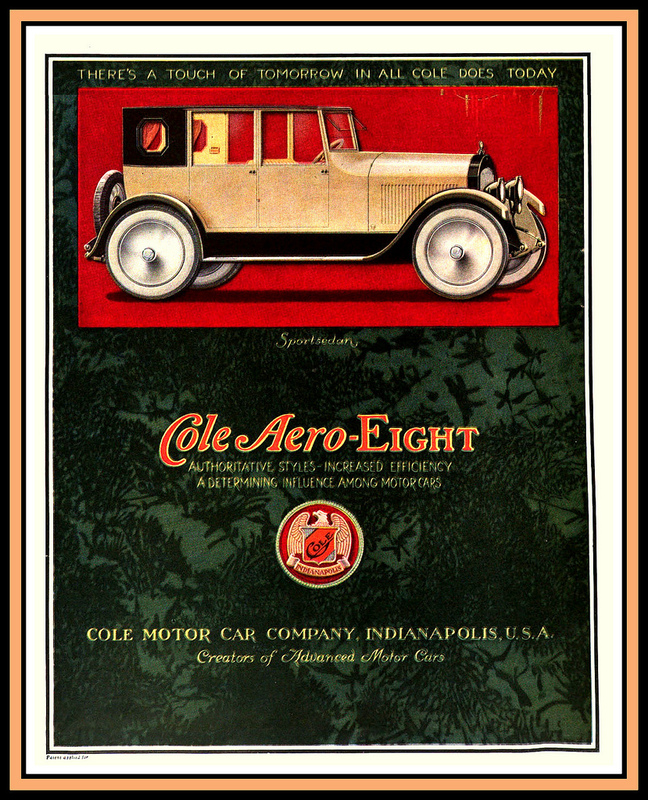 The Cole Motor Car Company was based in Indianapolis, Indiana and was around from 1909 – 1925. 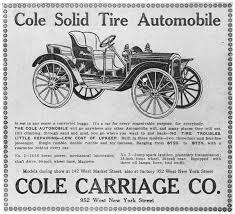 Like several other auto manufacturers, Cole got its start as a Carriage manufacturer. In 1904, Joseph Jarrett Cole (JJ Cole) purchased the 1904 Gates-Osborne Carriage Company and soon renamed it the Cole Carriage Company. 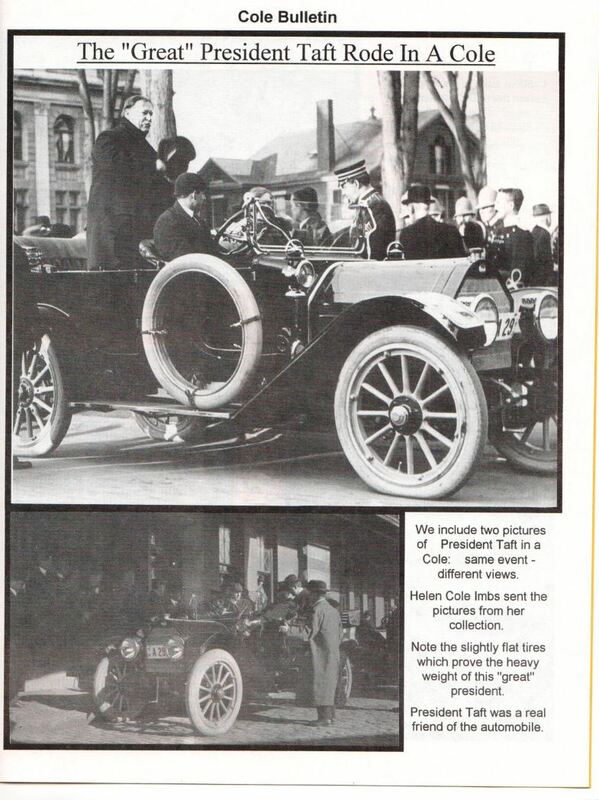 Cole was making about 3000 carriages annually when in 1908 he got serious about making an automobile. 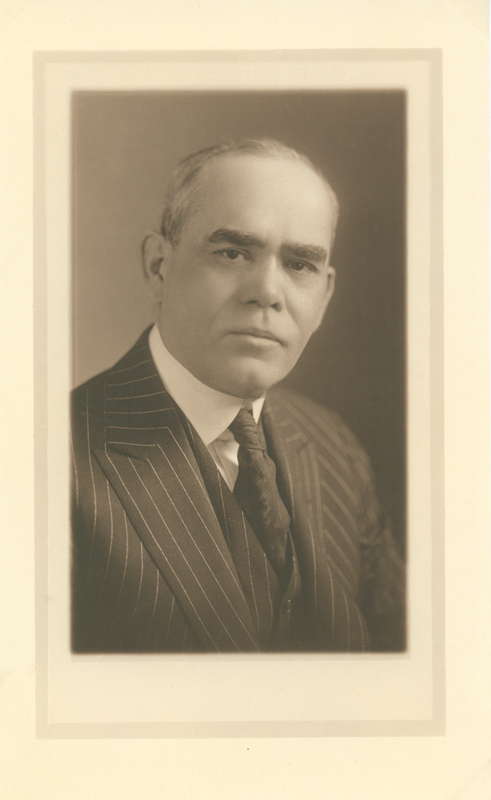 With Charles S. Crawford, who later worked for Stutz, Cole designed the Cole Solid Tire Automobile which was a high wheeler vehicle. Cole sold 170 of these vehicles before deciding that there was not a market for those cars. There is one known Cole high wheeler that exists today. 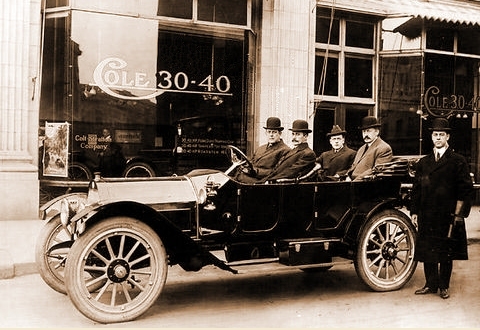 In 1909, Cole Carriage Company was reorganized into the Cole Motor Car Company. 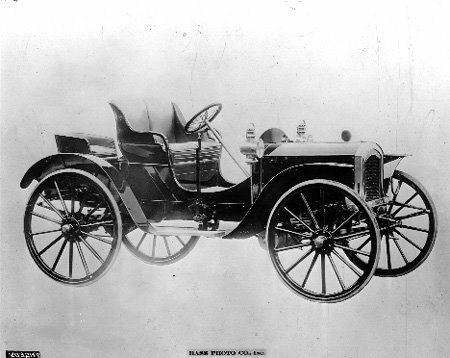 In the summer of 1909, Cole came out with a new car called the Series 30 which was a 30HP 4 cylinder engine based car that came in four different body styles. The cars ranged from $1400 to $1500. Cole sold 783 cars before the years end. The Cole 30 Flyer was also successful in auto races as well. One of them won the 1909 Brighton Beach Marathon, a 24-hour-race with 16 participants. Also, two Series 30 Flyers, driven by William “Wild Bill” Endicott and Louis Edwards, entered the Massapequa Sweepstakes, one of the 1910 Vanderbilt Cup Races. Endicott won the prestigious 10-lap event, covering 126.4 miles (203.4 km) in 138 min 4.32 seconds. Cole also had a 6 cylinder engine in 1913 for its large 132in wheelbase 7 person touring car. The prices in 1913 ranged from $1985 to $4000 for the limousine version. 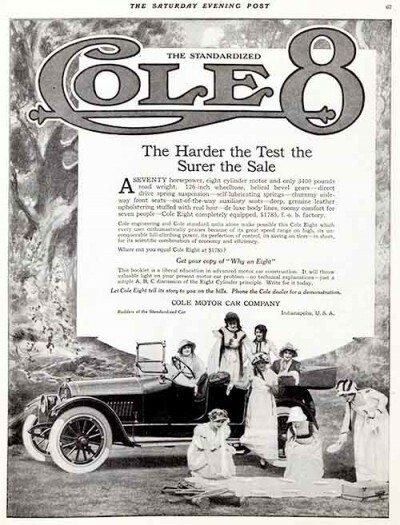 Sales had been low in 1914, so Cole reduced prices for 1915. Further, there were new designations – again – and even some new cars, too. The Four was now called the Standard 4-40. It lost the toy tonneau, and the remaining cars were offered much cheaper: $1,485 for the two open cars and $1,885 for the coupe. The Six was split into two ranges. The smaller Model 6-50 got a 29 HP engine and a 126 in (3,200 mm). wheelbase. It offered a 4- and a 7-passenger touring car $1,865 (still cheaper than the previous Four), a roadster that became more expensive at $2,465 and the coupe at $2,250. Although the new Big Six 6-60, built on the previous year’s 136-inch (3,500 mm) chassis, got a powerful 40 HP engine, prices were lower than the earlier Sixes: Roadster and 7-passenger touring car for $2,465, coupe at $2,750, and limousine at $3,750. Joseph Cole negotiated with William C. Durant about a take-over that would have made Cole a GM subsidiary. Cole finally refused. engine, and about at the same time as the mighty Cunningham V-8 debuted, Cole brought out its own V-8 powered automobile – and would stay with it until the very end of the make, dropping its Fours and Sixes after 1915. This engine had a displacement of 346.3 c.i. and delivered 39.2 HP. 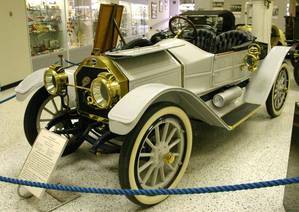 It was built by Northway, then a division of General Motors that also manufactured the V-8 for Cadillac. The car was named the Model 8-50. It had a 127-inch (3,200 mm) wheelbase. Five body styles were available at prices between $1,785 and $3,250. There were few changes for 1917. The car was now called the Model 860. There were five body styles at about the same price level. Some of them received quite flamboyant designations such as “Tuxedo Roadster”, “Tourcoupe”, and “Toursedan”, of which a “Foredoor Toursedan” existed, probably a 2-door sedan. 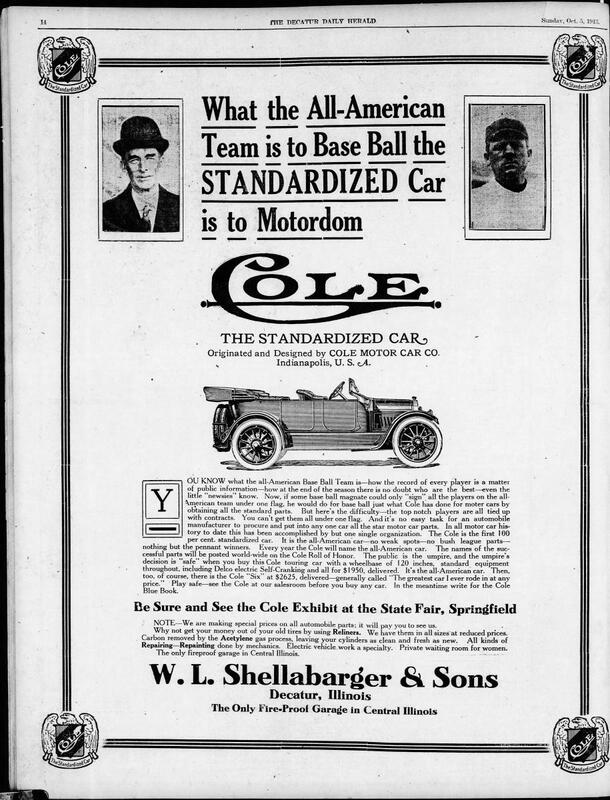 4193 Cole automobiles were manufactured in that year. apparent in 1918. 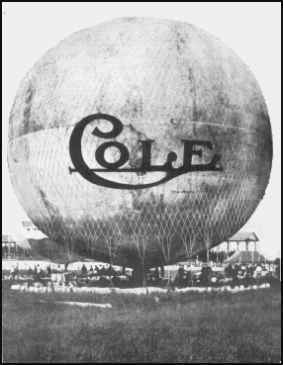 Advertising slogans were “There’s a Touch of Tomorrow In All Cole Does Today” or “Did You Ever Go Ballooning in a Cole?”, the latter referring to the adoption of balloon tires as an option that year (they became a standard feature finally in 1925). The car was advertised as the “Aero-Eight” (internally Model 870). There were only three body styles left, a roadster, a “Sportster” and the obligatory touring car. They cost $2,395 each and seated 2, 4, and 7 passengers, respectively . The cars also became more fashionably styled. The 870 Aero-Eight was technically much the same in 1919 but there were now seven bodies to choose from at prices between $2,595 and $3,795 for the new town car and the “Tourcoupe”. Some closed bodies got an octagonal rear quarter window as a “beauty” feature. That year, 6,225 Coles were built. (24,000 km) possible on its tires. Available were only three body styles, all of them of an open type: A Roadster for 2 and a Speedster for 4 passengers at $2,750 plus a “Tourster” a.k.a. touring car for $2,850. But naming the product got even more creative. While “Sportsedan” and “Sportcoupe” might sound familiar in our ears, “Sportosine” and “Tourosine” for some closed cars definitely do not. These cars got adjustable, “storm-proofed” windshields that had an angled position. Cole switched to Johnson carburettors and introduced a one-piece rear axle and a brake adjuster. The gear ratio was 4.45 (until 1922). A new measure for power replaced the antiquated N.A.C.C. rating. Thus, the Cole V-8 came in with 80 bhp (60 kW) and stayed there until car production ceased. Prices were slightly up and were between $2,750 and $3995. 1921 Coles were only slightly altered. Most of the exalted terms vanished – but “Sportosine” and “Tourosine” remained. There were 8 body styles that were substantially more expensive: $3,250 for the three open cars and between $4,250 and $4,450 for closed. Cole opened new, wider production facilities in 1922. However, sales went down rapidly, mainly because of a short but severe recession. Although there were more models to choose from and prices were reduced drastically (most to a level under that of 1918 / 1919), only 1,722 cars were built of the Model Aero Eight 890, as the car was called that year. The wheelbase was increased by a quarter inch, and the frame ends were split. The Sportcoupe had a weight of 4,155 pounds (1,885 kg). The car was priced at $3,385 with a 75 mph (121 km/h) speedometer. cowl ventilation, and a new windshield with an adjustable upper half on open cars. Other elegant details were wire wheels instead of the previously used “artillery wheels” with fashionable disc wheels on the option list. For this year only, some cars had an added sporty touch with runningboards that did not span the whole length, leaving the chassis-mounted spare wheels “free”. Still, with eight types of bodies, prices for open cars were slightly up while those for closed cars remained the same. The most expensive 1922 model, the $4,185 “Tourosine”, was gone as were all those strange names, with the exception of the “Sportsedan”. Only 1,522 cars left the factory that year. In this situation and without any debts yet, J. J. Cole decided to liquidate his company rather than risking his fortune by going on. So, it is no wonder that the Model 890, now also called “Master” series, went little changed on the show room floors. Full-length running boards were back on all models. There were seven body styles, again sharply reduced to prices as low as $2,175 for open bodies, $2,750 for a coupe and $3,075 for other closed cars. A Cole was honored to pace that year’s Indy 500 race. Before the curtain finally fell, there were five cars available for 1925. Balloon tires (34″ × 7.3″) were now standard equipment, and the cars got new two-piece rear bumpers, so-called “bumperettes”. Although Joseph Cole began liquidating his firm early in 1925, 607 cars left the factory. He died suddenly of heart disease on August 8, 1925, shortly before liquidation was finished.